This wasn’t a bad Penn State team, and certainly 2010 wasn’t Fitz’s best squad, but the way they lost this game is a perfect example of a classic Fitz (and McCall) blown lead where we can’t keep our foot on the pedal. NU was up 21-0 and let PSU score 35 unanswered points to lose 35-21. Oh, and JoePa won his 400th game (which has presumably been vacated). This was a baaaaad Indiana team. The finished the season a mere 3-9, including a loss to beat down from Ball State. This game had no business even being close, but our offense only mustered a mere 19 points to lose 21-19. This was a bad one that almost lead to the ‘Cats missing out on the postseason. Army went 3-9 that year including losses to some BAD teams. NU was simply out-coached here. This was a bad loss to a bad Purdue team who went 4-8 that year. NU only mustered 17 points in the loss, and featured a classic last second missed field goal by Stefan Demos which could have forced overtime. Shouts to Stefan! This is loss that could have taken the 2009 season from good to great (though there was also a bowl loss that could have done the same thing). Syracuse went 4-8 that year and was featuring Greg Paulus at QB. It’s hard to pick on Fitz in his first season as head coach but we’re gonna do it here and we’re going to do it again in a minute here. I don’t really care the situation – there is now excuse for losing to an FCS squad. And I think it’s fair to point out that NU didn’t just lose – they got pounded 34-17. I think it’s the way this loss happened that earns it the bronze. If you don’t know what I’m talking about, just watch the video below. This loss also could have pushed NU to 6-6 and a bid in the [Insert shittiest bowl game sponsor] Bowl. Again, it was Fitzy’s first season – which is probably what keeps this game out of the number one spot. But our friends at MSU set the record for largest comeback ever in FBS history. 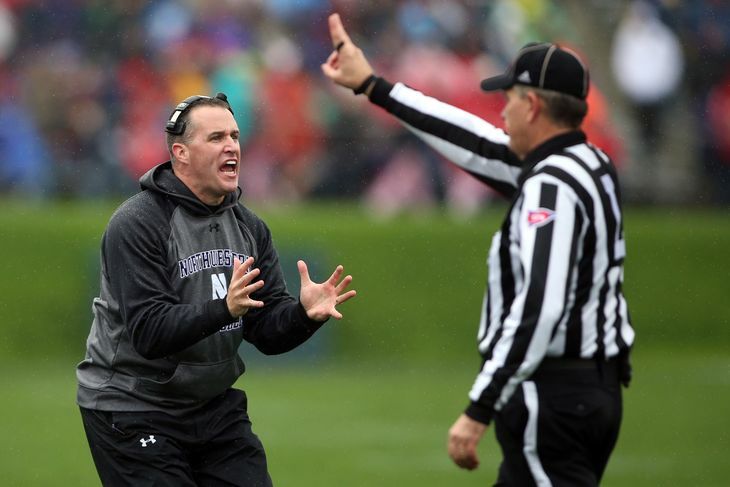 NU allowed 38 unanswered points in the 2nd half and completed one of the largest meltdowns in college history (perhaps the Choke at Doak earns the top spot since, you know, we’re Northwestern). NU had 4 tries from 1st and Goal to put away arguably the worst FBS team in the history of time. Had they won, Duke would have finished the season 0-12 and have overtaken NU for the longest losing streak in D1 Football history. However, the ‘Cats couldn’t muster the 9 yards they needed and found themselves missing out on a bowl at 6-6. This record may never have a shot at being broken ever again. God dammit. That’s all for now folks. It’s almost gameday!